I had 252 comments on my Sew Mama Sew Giveaway post. The overwhelming favorite sewing tool is a rotary cutter! 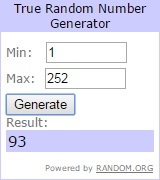 Without further preamble, I am happy to announce that the random number generator selected number 93.